We will start by picking you up at your Bali hotel early in the morning around 2am depend the area of you lodging stay, and after one and half hour drive we will reach mount Batur starting point, On arrival at starting point of mount Batur hiking, you will be welcomed by our expert mount Batur hiking local guide, the guide will issue some security data and a flash light. From this point you will begin your hiking for two hours to the top, after touch base at the top you will stunned with the beauty of the dawn. The trekking guide will serve breakfast for you (bread, steam bubbled egg and hot tea). 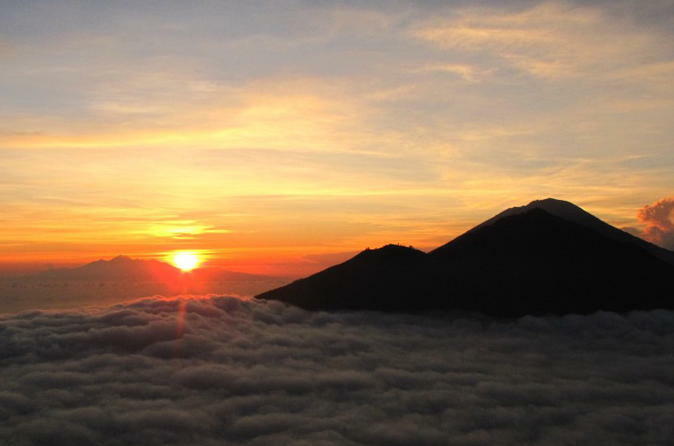 It is an awesome moment and unique experience you will have when you see the sunrise while having breakfast on the top of Mount Batur. After finish having breakfast and take picture, we will go to complete the trek by exploring 2 new craters and descend to the finish point where the driver is waiting for you. On the way home from the trek we will stop off at a traditional Bali coffee processing or Bali agriculture, place to see various Tropical plantations and see how to make Balinese coffee in traditional process, and we also get a chance to taste some of them like local herbal teas, chocolate, coffee and the unusual Coffee Luwak, the most expensive coffee in the world. Than afterward we drive back to your Bali hotel. 3:45 am : Arrival at starting point, introduction and safety procedure briefing by our experience professional hiking guide. 4:00 am : Begin our hiking to Mount Batur Bali. 4:20 am : Continue our hiking to the summit crater. 6:15 am : Arrive at the summit crater, where we witness the spectacular view and sunrise while enjoy refreshments of eggs boiled in volcanic steam. 7:00 am : Continue our trek around the entire crater. 8:00 am : Begin our descend to the finishing point of our trek.